As you know, the elegance of wearing pearls has no age. Although the beauty of pearl earrings comes in every shape and any color, black pearl earrings will always carry a larger dose of mystery and sophistication. Wearing pearls means wearing beauty and clarity, radiance and wisdom. And with black pearls, you will instantly create a romantically dramatic set. Read more to discover our seven black pearl earring sets that are appropriate for any age and occasion. Learn how to style them and pick your favorite pair! To begin with, pearls are unlike other gems. Because they are produced by living oysters, this makes them undoubtedly unique and special. The value of the pearl stands in the fact that it is perfect by its nature. Moreover, jewelry pearls have no age. Their beauty and value increase by time. One of the most appreciated pearls is the black pearl. This is mainly because the person who wears black pearls actually wears power. They can be both intriguing and alluring. 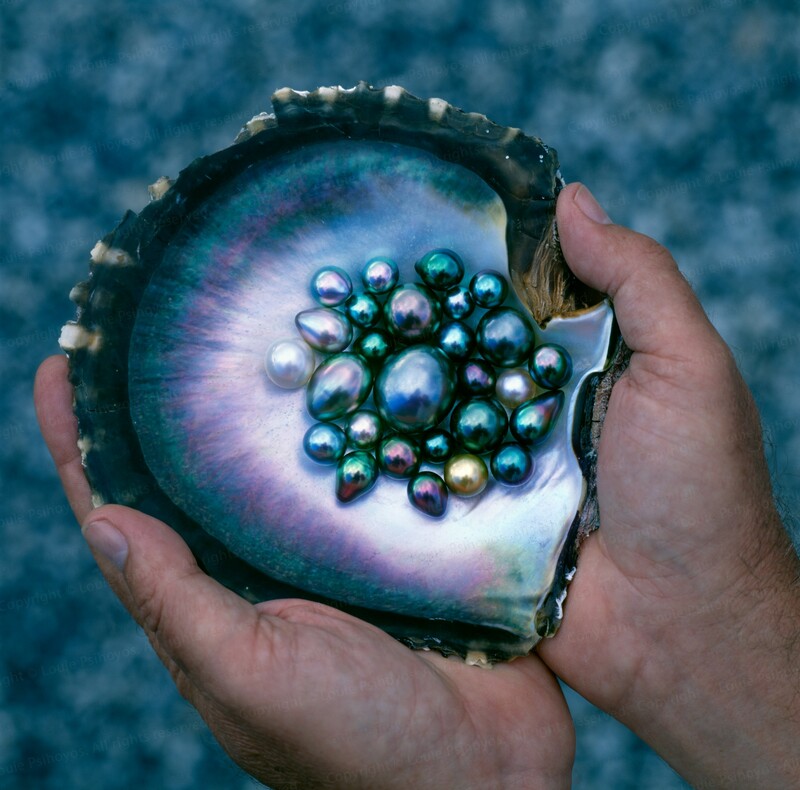 Depending on the story that is told, black pearls can symbolize multiple things. If it’s a Christian story you will see that the pearl is associated with the man’s soul. If it’s an Indian story, then the pearl is associated with the purity of the wedding day. Lastly, according to a Chinese story, black pearls first appear in the heads of dragons. Moreover, they can symbolize the power of reborn, a long searched solution to a problem, like finding a treasure after a quest and even the tears of Adam when he was cast from heaven. Black pearls seem to be associated with religious symbolism or even with medicine; they have the power of healing the skin, the heart and different allergies. Plus, they are associated with finding wisdom as well. In general, black pearls have been emblems of prosperity or lucky charms that protect the person who wears them from negative energy and gives them the ambition to fulfill their dreams. It is believed that pregnant women who wear these gemstones will have a better energy and will be more optimistic. Black pearl earrings come in many shapes and forms but you can obviously choose the one that is perfect for you. How do you know which one is perfect for you? Here you have some wonderful suggestions for different pearl categories. Think about your style and your wardrobe and then pick the pair that has the ability to make you shine. They make excellent accessories for the entire day, but they are also key pieces for evening black tie events. You can opt for graceful Tahitian pearls, flawless Japanese Akoya pearls or versatile freshwater pearl pieces. Whichever type you choose, the results are guaranteed to make the owner feel special. This is one set that will make your buying decision easy to make. The classic black pearl earring studs are a great gift for someone you love and who appreciates simplicity and elegance. Or you can just buy them for yourself. The freshwater black pearl earring set is perfect to wear at any moment of the day, at the office, at school, at dinners or even at home gathering. The round shape aims to create harmony with your facial features; it will soften your face and accentuate your natural beauty. Perfectly shaped, incredibly lustrous and quite classy, this pair of earrings would look exquisite on you should you wear your hair in a simple chignon. This second pair of freshwater black pearl earrings is the true epitome of fine sophistication. Their smooth styling with clear crystal adornments makes these earrings reminiscent of vintage Hollywood styling. The 26 clear crystal stones are truly remarkable. The solid silver cutout styling offset by the brilliance of the clear crystal stones accent the center pearl and gives the Carina Earrings a solid sense of style. These black pearl Carina earrings easily complement any style from casual to elegant and everything in between. Keep them for yourself or give them to someone special who has an obsession for real pearls. 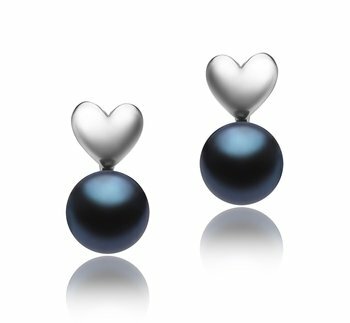 This Tahitian black pearl earring set is one the most elegant sets. They are definitely the opposite of dull and boring. Three words come up in our mind: bold, luxurious and outstanding! The combination of diamonds with Tahitian pearls, along with the 14K White gold gives them shine and glam. The AAAA grade quality is quite obvious. These black pearl earrings are easily versatile because of the rich black color and other color effects that the Tahitian pearls have. Wear them with bright colors to obtain the wow effect, or with black to enhance the mystery. Appropriate for special and formal events, this pair of black pearl earrings will bring you many compliments. The long shape of the Merry Black Earrings will elongate your face. Plus, you would look stunning with an off shoulder long or midi dress, Brigitte Bardot style. Make a special Valentine’s Day gift with this wonderful earring set, a combination of puffed silver hearts and lovely pearls. Appropriate for anniversaries or graduation days, this pair looks very cute and delicate with dresses or silk tops. This freshwater black pearl earring set is really pretty. It captivates the eye with the smooth and fine glam of the pearl and the tiny silver heart. Wear your hair up or in a ponytail and enjoy your day in a casual, flirty outfit. Don’t forget to smile and shine. Just as your pearls! The Brisa pair of black pearl earrings is a vintage-inspired design that will surely bring a classic romance to your wardrobe. The small black freshwater pearls are clustered together in a beautiful and lustrous arrangement of pearls that has its own identity. These statement dangling earrings can be easily worn on special occasions or on holidays when you want to impress. You can wear them with a monochrome outfit or with a beautiful flowy dress. Fashion experts recommend wearing this type of earrings with a bare neckline and even with a pony tail to give more exposure to your earrings. This earring set is like a double dose of glam and elegance. Their design reflects a modern and stylish interpretation of the classic pearl studs. This set is definitely for the feminine woman who is fashionable and trendy with the times. Sweet and simple in combination, these earrings are a perfect way to express your personality. Don’t hesitate to wear the Melissa black pearl earrings as part of your daily office outfit or an evening out look. 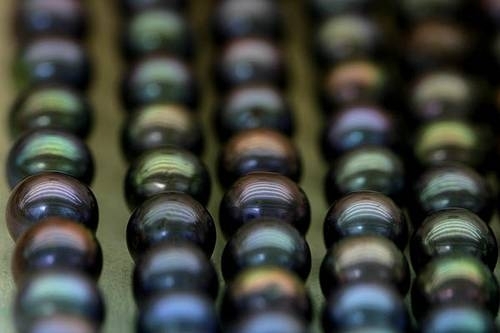 The Japanese Akoya black pearls will mesmerize you and the others as well. The Colleen Black Japanese Akoya Pearl earrings are a wonderful set that will transform you into a true diva. Wear them and we guarantee you will be at the center of attention. Their unique elegance stays in the black symphony of pearls combined with shiny silver. The AAAA quality is seen in the perfect round shape and in the natural luster of pearls with a smooth surface. Without any doubt, the black color is utterly beautiful and it changes in different dark shades depending on the light. Every woman should own at least one pair of black pearl earrings and this one is absolutely a must-have. It will compliment any selection in your wardrobe! Celebrities like Anne Hathaway, Angelina Jolie, Alexis Bledel, Reese Witherspoon and are just few actresses that wore black pearl earrings on different occasions to complete their look in a simple, elegant and perfect way. Even the glamorous Sophia Loren, the Old Hollywood movie star is known for her black pearls love. When you decide to buy this master black pearl jewelry be prepared to embrace their ultimate sophistication. Versatile and easy to wear any pair of these black pearl earrings will help you create a dashing and marvelous outfit. With them, you will never lose the battle with fashion since their elegance is timeless. To conclude our black pearl journey, we invite you to visit our entire collection of black pearl earrings any time you want. You will be able to find any type of earrings you desire: with freshwater black dyed pearls, with Tahitian pearls or black Japanese Akoya pearls, black pearl stud earrings or black pearl drop earrings. In the end, we just presented you a few of our favorite black pearl earrings that can be worn on different occasions and which are suitable for any taste and style. Oh, and did we mention they are all extremely affordable? You really don’t have to pay a fortune to own a precious pair of pearl earrings. You can wear them any time you feel like it and create your own new jewelry signature every day. Every woman deserves to feel special 24 hours a day. Wear our black pearl earrings and do not hesitate to be classy and fabulous as our beloved Coco Chanel once said. These are true words to live by. This entry was posted in PearlsOnly Blog by PearlsOnly Team. Bookmark the permalink.